Risk management is fast becoming a popular area for graduate and postgraduate studies. Risk management essentially caters to the identification, analysis and prioritization of risks and designing mechanisms to minimize risks as much as possible. These risks can be in terms of finance or risks associated with the economy at large, natural disasters, or occupational risks. The list is never-ending. But primarily it deals with managing financial risks and liabilities. Indeed, managing risks has become very important for running a successful and profitable venture. PhD in risk management is especially gaining popularity in the United States. Various reasons have contributed to it. Firstly, there is a growing perception in the country (and rightly so) that risk managers in the States are amongst the most highly paid working professionals. This is because companies invest heavily in people who can help the company avoid risks itself. Thus by hiring individuals like these, companies are actually offsetting future losses due to bad risks. Skills acquired in a PhD degree in risk management assure that there are minimal risks associated with the working of a business. There are many institutions that provide a PhD in risk management. 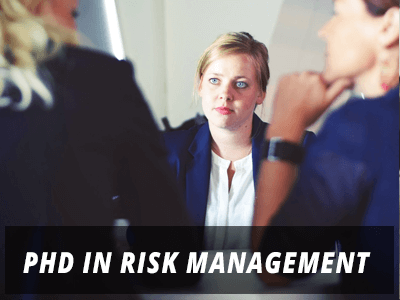 The Institute of Risk Management (IRM) and the Risk Management Society (RIMS) are amongst the top organizations that train and facilitate people on how to reduce risks. The PhD program is designed so as to educate the students in theoretical concepts and analytical skills which help them assess a given risk situation. Risk managers are good team players and are good at decision making. The PhD program polishes these skills so that they can be applied in the professional world. The job opportunities for PhDs in risk management are plenteous. From working in banks to having senior positions in global organizations like the World Bank, risk managers have plenty of options to choose from. However, like all PhDs, one in this field may also lead to careers in the academic world as professors and researchers. Therefore, pursuing a PhD in risk management is ideal for those aiming to build a career in the financial sector or who have an interest in analysis and research. Q:How long does it take to get a PhD risk management degree? A:It can take 4 to 8 years to complete a PhD in risk management. This is the highest level of education you can pursue in risk management. The program is usually research oriented and aims at providing students with advanced knowledge and research skills. The exact duration of the program will basically depend on the institute you enroll in. Q:What are the admission requirements for a PhD risk management degree? A:The admission requirements may vary from university to university. Generally, students will be required to submit official transcripts of their bachelor and masters degree, letters of recommendation, and a personal essay. Other requirements may include passing scores in an entry test and work experience. Check with the school you plan to enroll in to learn more about the admission process. Q:What can you do with a PhD risk management degree? A:There are a number of career paths you can consider in the field of risk management. A PhD in risk management may qualify you for executive and research-based job positions in various private and public firms. Here are some job positions you can consider: insurance executive, risk management, bank manager, public policy analyst, and actuary. The income level will vary from job to job and will also depend on your specialization. According to the US Bureau of Labor Statistics, top executives made a median annual income of $101,650 in 2012. Q:How to get a PhD degree in risk management? A:To successfully complete a PhD in risk management, you must meet all the program requirements. These requirements may vary slightly from university to university. Generally, the degree requirements include: minimum number of credit hours, completion of a research project and dissertation, and completion of all assignments. You can check with different schools to find out more about the program. Q:How fast can you get your PhD risk management degree? A:There are a number of universities offering accelerated PhD programs. The duration of an accelerated PhD degree can range from 2-3 years. Students can opt for excessive credits every semester to complete the coursework in a short time span. The minimum program completion requirements include successful completion of a dissertation and research project. Q:How many credits are required for doctorate in risk management? A:To successfully complete a doctorate degree, you will need to earn 90-120 credits. The exact credit hour requirement will depend on the university you enroll in. You mus have completed a masters degree and a bachelors degree to enroll in most doctorate programs. Please remember that the duration and credit hour requirements may vary from college to college. Q:Where can you work with a doctorate in risk management? A:With a doctorate in risk management, you may qualify for different executive and research positions in public and private firms. You can also consider analyst job positions, depending on your area of specialization. Some of the sectors where your qualification may be in-demand are: insurance and banking, research, federal agencies, etc.